In Greek mythology, the labyrinth is the place where the Minotaur is hidden and imprisoned. It is therefore not necessarily a real place. The labyrinth, as we know it today, is highly inappropriate. Because it has an entrance, a clear path and an accessible center. 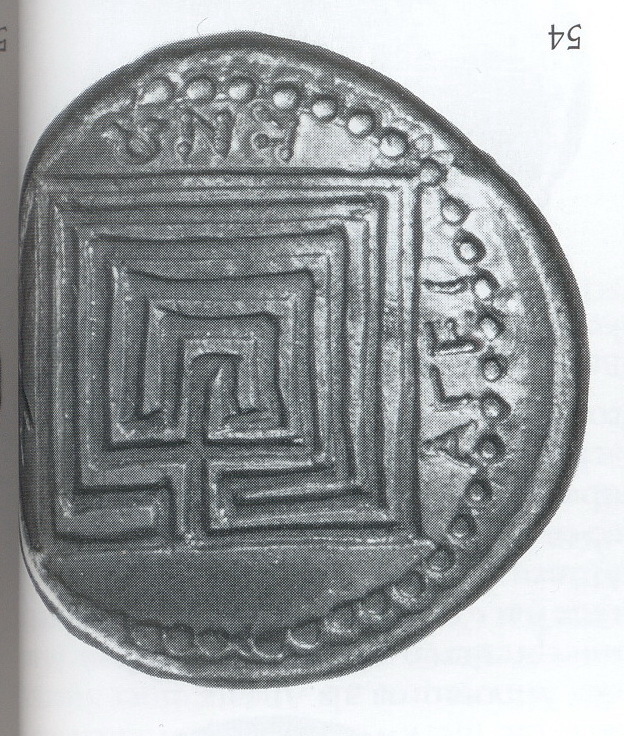 Thus, on the silver coins from Knossos we also find very different interpretations of the labyrinth. There are meanders and other symbolic representations. I want to pick out a motif today and take a closer look at it. They both represent the same thing. Although the “Berlin” coin seems to be more exact, it contains small errors in two places in the upper area. Two vertical lines collide, where a gap should actually be. This area is more accurately represented on the “London” coin, although the lines there are harder to see. I made a “final drawing” that shows what the coin maker wanted to show. You can see lines that follow a certain pattern. They are symmetrical, repeating themselves and showing an intricate “path system”. The drawn red thread shows that. There are four nested paths without beginning and end, but also without entrance. This is not “our” labyrinth but better suited as a prison. The Minotaur would not come out that fast. This could be a hint of the Roman sector labyrinth hundreds of years later. But it also shows a certain relationship to the Babylonian labyrinth, hundreds of years older and developed in a different culture (see the labyrinthine finger exercises in the post about the Babylonian labyrinth). 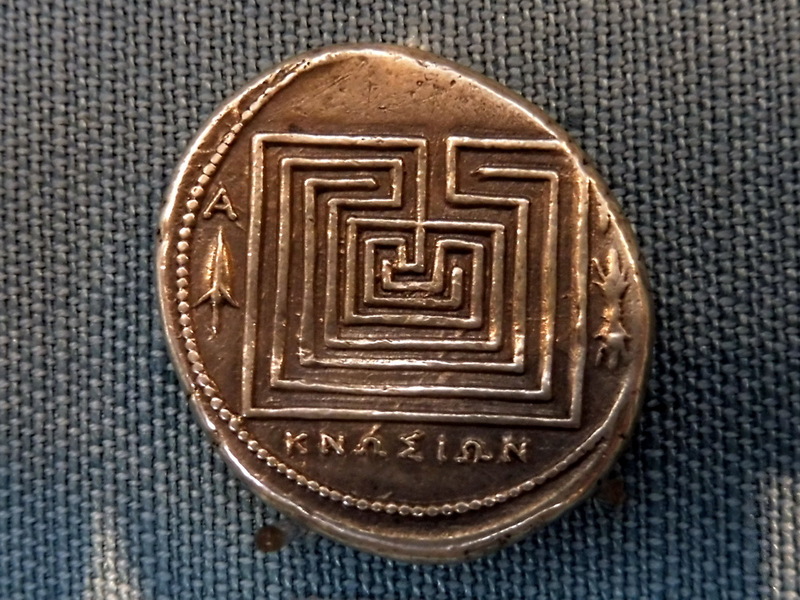 The silver coins of Knossos are quoted again and again when we talk about the labyrinth. They can be found in the major museums of the world. Last year I was able to see and photograph one of them on a trip to Vienna in the Coin Cabinet of the Kunsthistorisches Museum. The book “Labyrinths” by Hermann Kern shows illustrations of 20 coins from the British Museum in London. 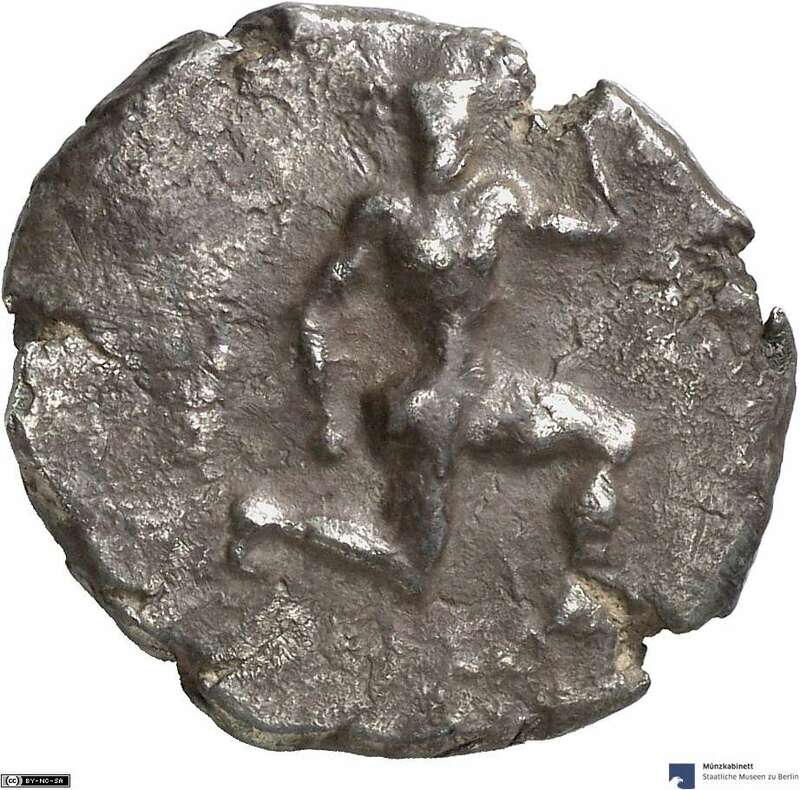 Meanwhile there is a digital interactive catalog of the Coin Cabinet of the Staatliche Museen zu Berlinn, where you can access more than 34,000 coins. With the search term “Labyrinth Knossos” I found 22, which I can show here under the following license. The coins cover a period of 425 BC until 12 BC. Shown is mostly the reverse of the coin. The Cretan town of Knossos has been closely linked to the myth of the Minotaur since antiquity. His mythical dwelling, the labyrinth, was one of the city’s landmarks. However, the depiction of the labyrinth on the Knossos coins came in very different ways, since a real non-existing place had to be shown. The labyrinth is always pictured in supervision, but with different outer shapes and structuring. 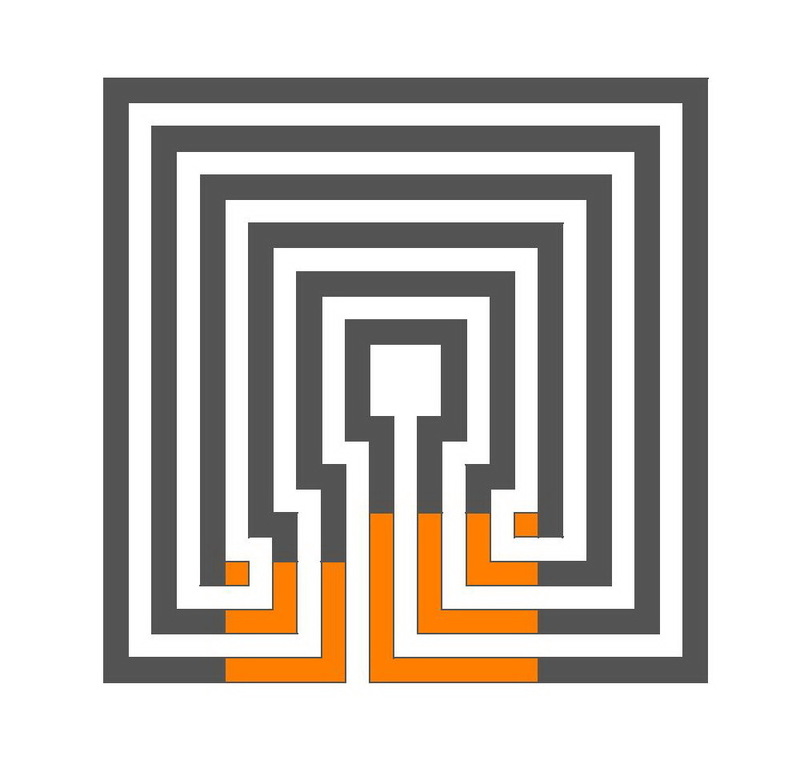 Only in supervision, the labyrinth can be detected as such. I highly recommend visiting the digital catalog. There are to find many additional details about the coins. In particular, there is the possibility to look at both sides and to retrieve further information. 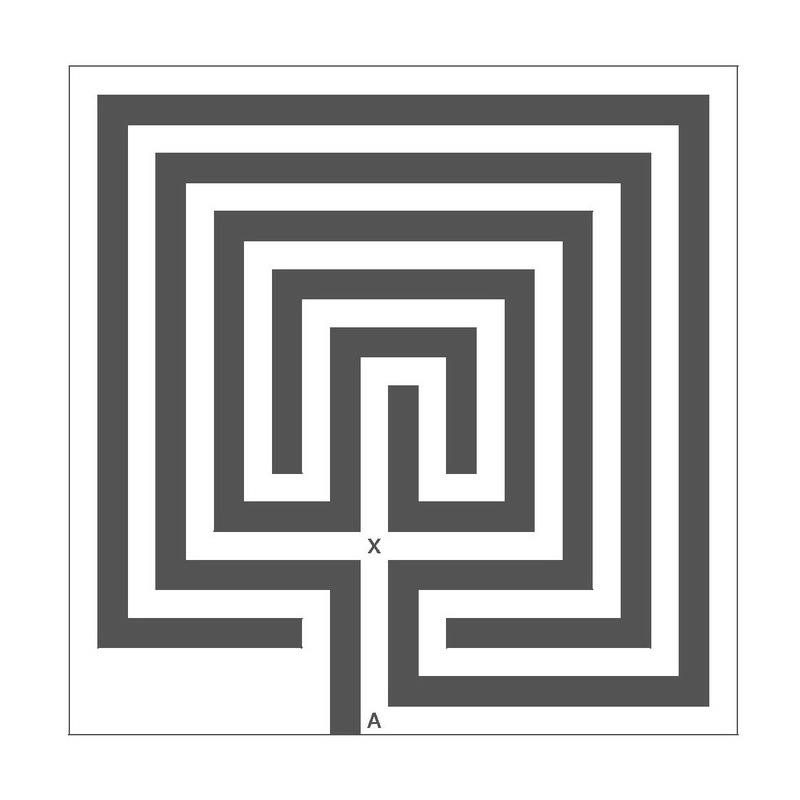 It is remarkable that the four usual turning points for the 7 circuit classical labyrinth are to be seen. Also the central cross of the wellknown seed pattern is to be recognised. However, which lines are the walls, and which the way? A little bit was also cheated with the line widths, because the both lower turning points do not lie on the same height. The walls are the black lines. The paths are the empty area in between. 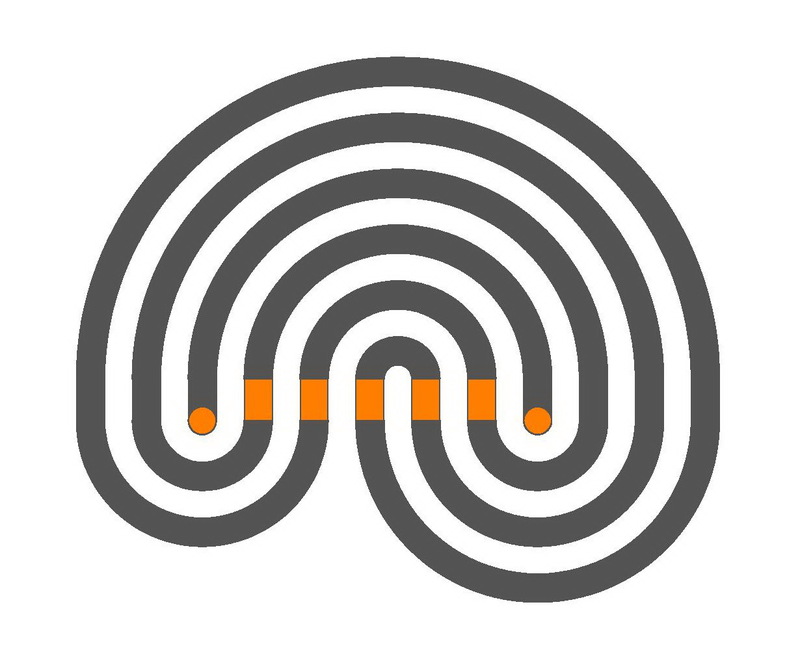 The four turning points, the starting point and the final point are connected with each other, without crossing as it should be in a classical labyrinth. Hence, here we have three coherent lines instead of two. However, the paths are crossing, this can not be. Also there is no real center, but a bifurcation. However, it is possible, to walk through the labyrinth structure by using all paths. Start in A, go to the right and from the crossroad point X on turn left, also while going out. Then one lands again in the starting point A and has crossed all ways. Or one goes in A upwards and from X on always to the right. Then one reaches again A after pacing all ways. It is a “passageway labyrinth” with bifurcation. This is not allowed for a labyrinth in the strict sense, but in the Baltic wheel or in the Wunderkreis of Kaufbeuren we will find this centuries later. Or of course in the true mazes of the later centuries. Either a joker or a trainee who has not paid attention so properly in the drawing lessons has stamped this coin? Or here something is already to be found what appears in the labyrinth history centuries later again. 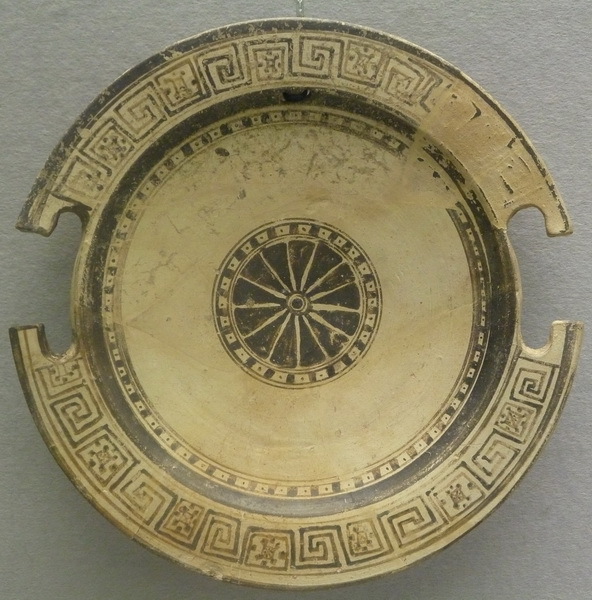 I have found a meander suitable for it in the antique collection of the Martin von Wagner museum of the university of Würzburg on this Aeolian plate from the time about 575 BC. We read from the left to the right: 0 is outside, 6 stands for the middle, 1 to 5 for the circuits. We read the path sequence (line sequence, level sequence): 0-5-2-3-4-1-6. This is the order in which the paths are followed. Odd and even integers must alternate. The first integer after 0 is always an odd number. 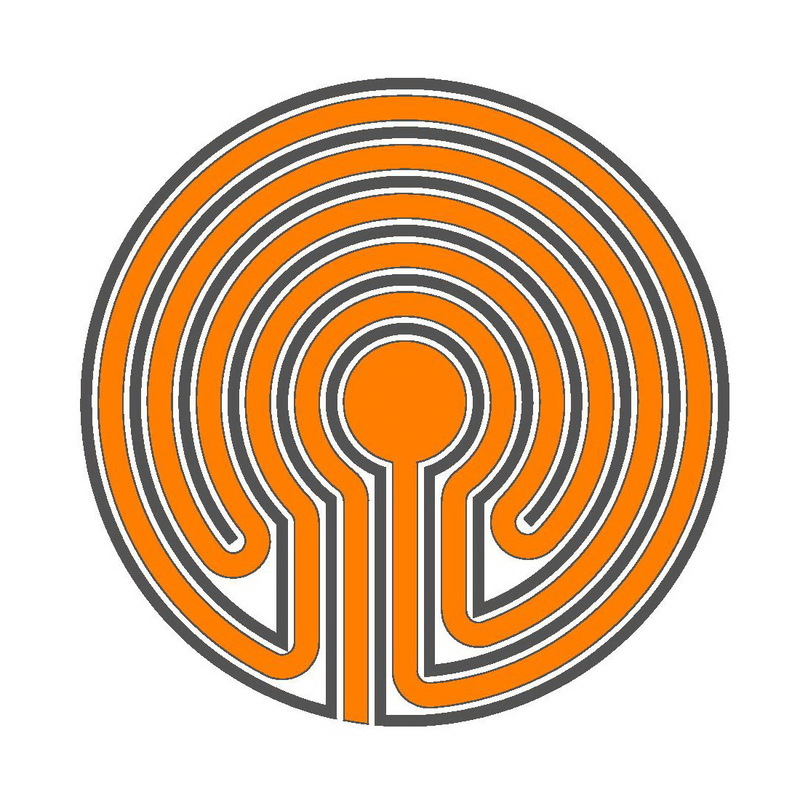 The labyrinth has 5 circuits. The first step leads me directly quite near to the center, into the 5th circle. Then I turn outwardly to the 2nd circle, I approach the center by turning to the 3rd and 4th circle, from where I turn quite outwardly into the 1st circle, and from there, I finally enter the center. All formative principles which Hermann Kern (Labyrinthe, 1982, p. 14, German edition) demands for a labyrinth are fulfilled. Is there a historical labyrinth with this alignment? So much I could investigate, this does not seem to be the case. (Objections are welcome). 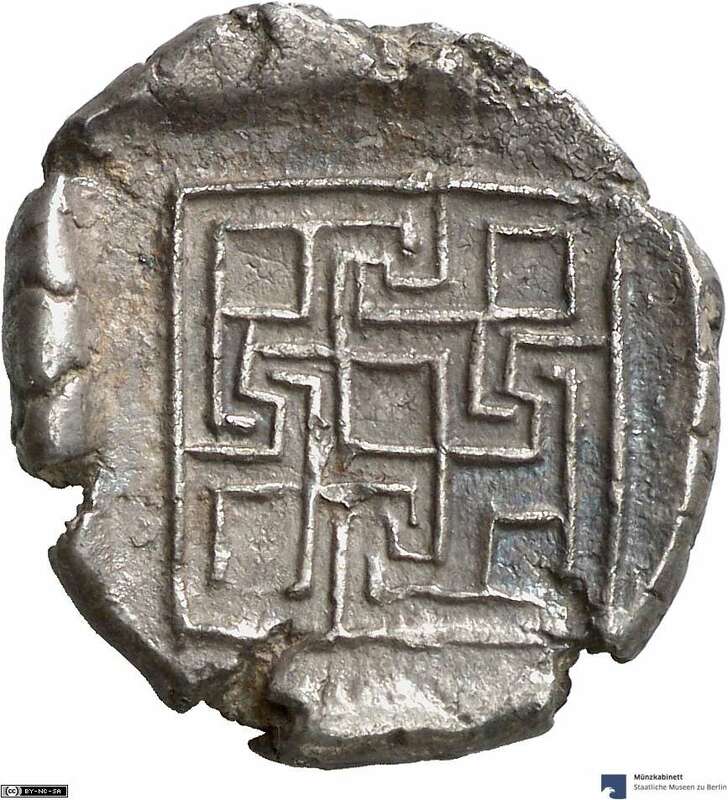 Among the silver coins of Knossos from the time about 500 BC till 100 BC, mentioned in one of the previous posts, there is a coin with the depiction of a 5 circuit labyrinth which is faulty, unfortunately. 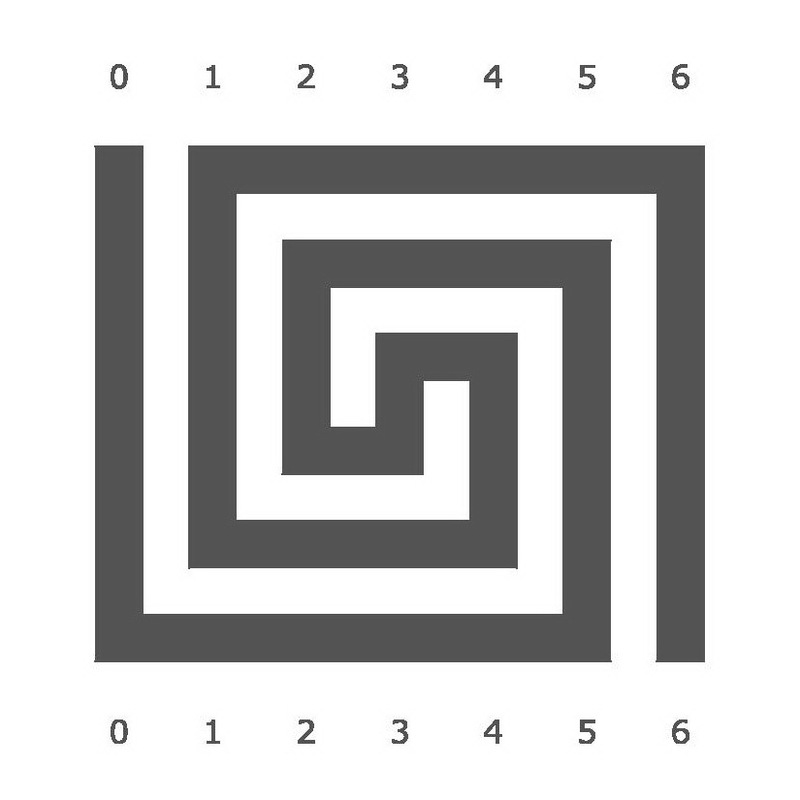 In the following drawing you see a square classical 5 circuit labyrinth with the path sequence 0-5-2-3-4-1-6 . The walls are black, the path is the white empty place between them. Who wants, can compare the layouts and find out what the old Greeks have made wrong on their coin. To be fair, I must say that there are still 7 more different versions for a 5 circuit labyrinth. However, the middle can also become a little bigger. 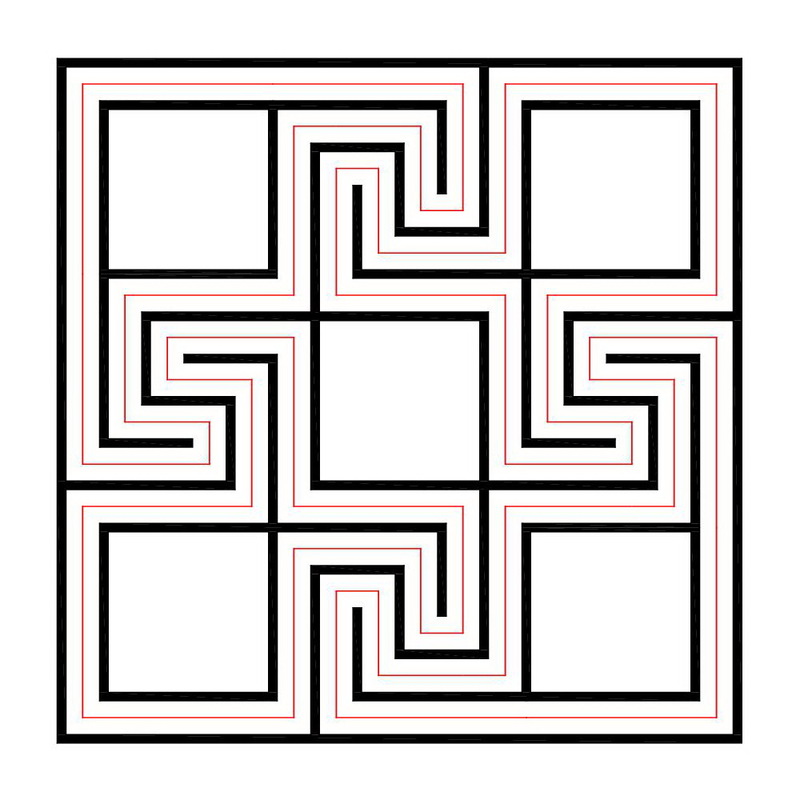 In the following drawing the seed pattern contained in the black walls, is marked in colour. The seed pattern can be simplified very much to 2 dots and 5 lines. To draw the labyrinth I join the free end of the innermost line in an arc with the free end of the line to the right. Then I go to the left line and join it with the free end of the right line parallel to the first arc. And so on with each line and dot. The seed pattern looks familiar. If one copies it, turns it around 180 degrees, and attach it, one receives the seed pattern for the 11 circuit classical labyrinth. Or in other words: Two meander of this type put together result in a 11 circuit classical labyrinth. The two turning points on the right and left side form a triangle together with the very center of the center. So the relationship with the Baltic wheel and the Indian labyrinth appears. 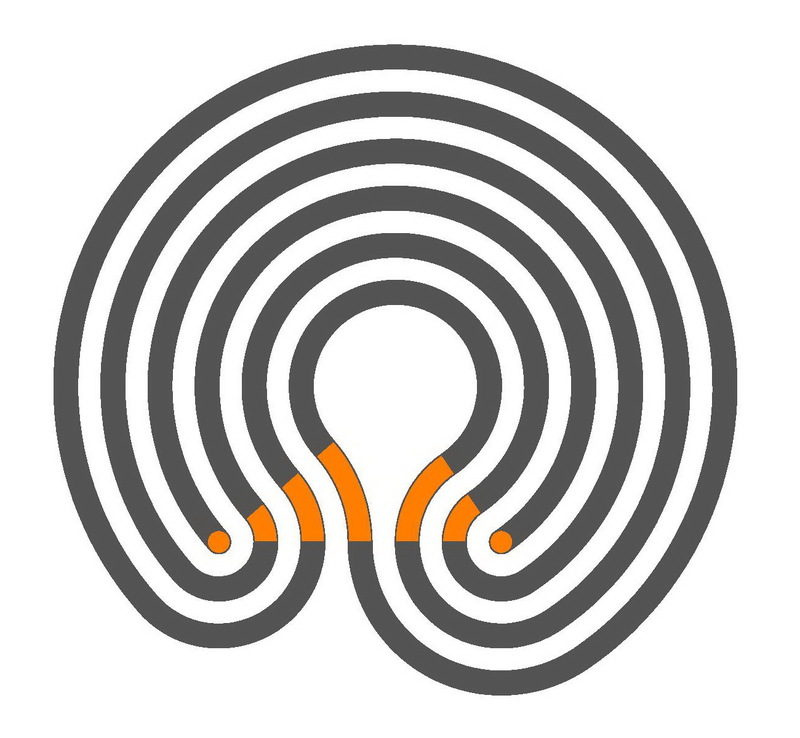 However, in those labyrinths one doesn’t reach the center directly from the outermost ring outside as some circuits are added around the center. Besides, the Baltic wheel has a second short entrance/exit, disqualifying it as a labyrinth in the strict sense. We know the “staff” of the labyrinth from the Greek mythology: King Minos of Crete, his wife Pasiphaë, her daughter Ariadne, the hero Theseus, the master builder and inventor Daedalos, his son Icarus and the impossible mythological monster Minotaur, part person, part animal for whom the labyrinth was built as a prison. The origin of the labyrinth is supposed around the Mediterranean at the times of the Minoan civilization. 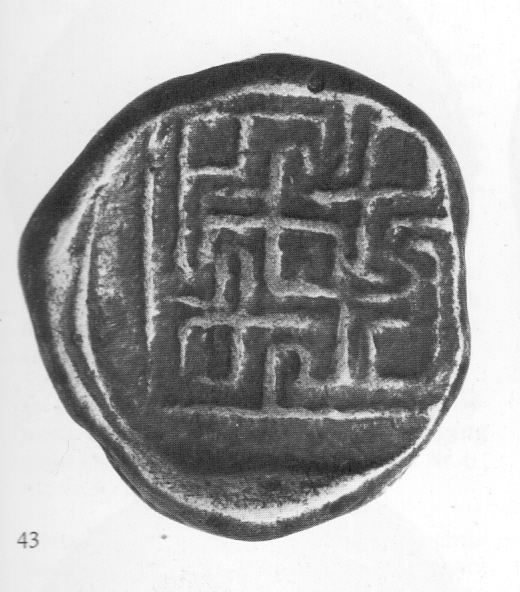 On Cretan coins the classical 7-circuit labyrinth with its unequivocal way into the centre is illustrated, as we know it even today as the “real” labyrinth. However, as a prison for the Minotaur this would have been extremely inexpedient. Only a maze with its dead ends and the bewildering paths could have been suited for this. Since the British archeologist Sir Arthur John Evans excavated the ruins of the palace of Knossos on the island of Crete, the location is seen as the labyrinth of the Minotaur. But there is not a scientific proof for it till this day. Did the the labyrinth come into being this way? Is there a historical, real labyrinth in which one could have imprisoned the Minotaur? Maybe it was rather the cave system from Gortys, also on Crete and not so far from Knossos? It is even called labyrinth. 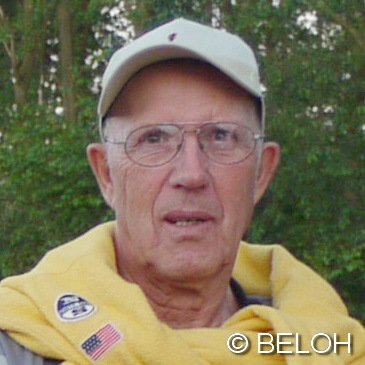 The best expert of this cave system is certainly the Swiss Thomas Waldmann who has been countless times in the subterranean passageways, knows a lot and has documented everything on his website “The Cretan Labyrinth Cave”. In cooperation with him a group of the University of Oxford explored the cave system this summer. 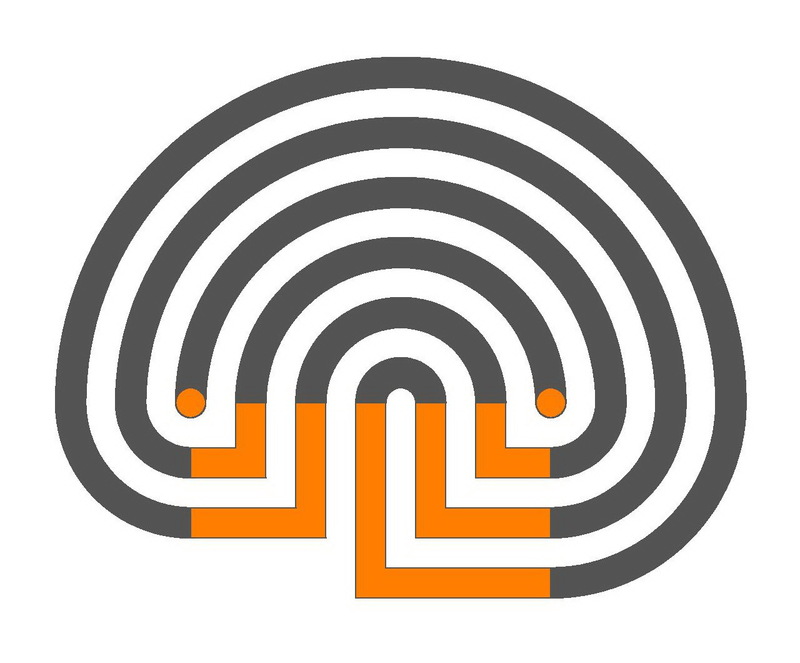 They called the project “Labyrinth Lost” and are reporting on it and will present the results of their research. Maybe this labyrinth cave may be accepted as the labyrinth of the Minotaur? In any case, a subterranean cave would be a better prison than a physical structure. Maybe we will never find it out and thus the mystery of the labyrinth will stay alive.